When it comes to your dental care, it is not difficult to maintain a healthy and beautiful smile. Following a basic routine, each day will keep cavities to a minimum and prevent other oral problems. Without spending a fortune, you can preserve your teeth and enjoy positive oral health. Brushing. The simplest way to begin an oral hygiene routine is by brushing each day. For best results, the American Dental Association, recommends using short strokes and covering each tooth. It is essential to brush twice a day and after meals. It is wise not to forget your tongue. This keeps breath smelling fresh. After three months, you should replace your toothbrush as well. Flossing. 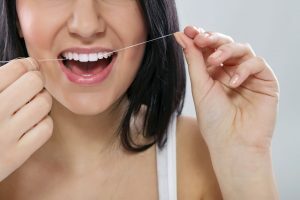 Flossing is a great way to remove food particles and bacteria that become lodged between teeth. It eliminates the items brushing cannot. It is crucial to floss gently in the areas between every tooth and the gum line. At first, you may experience slight bleeding. However, this is normal and will stop after a regular flossing routine is followed. Rinsing. There are various mouthwash products on the market. Many contain ingredients that lower plaque, keep breath fresh, and decrease the likelihood of developing gingivitis. Regular Dental Visits. Even when you practice a solid oral care routine at home, it is crucial to visit your dentist for annual checkups and cleanings. Professional cleanings are the best ways to scrape away tartar and plaque. A dental hygienist can explain the areas you may be missing with your toothbrush. Also, your dentist will carefully examine your mouth. This professional will detect small problems early before they become major issues. X-rays will be taken to determine what is happening in areas the eyes cannot see. Dr. Dana Walters teaches patients ways to develop a basic oral hygiene routine. These tips keep their mouths looking and feeling their best. What Happens to Your Body When You Drink Soda?